Little Red Riding Hood is taking a shortcut through the woods to see her grandma. But along the way, she sees a wolf running from a hunter. When she gets to grandma’s house, the scared wolf is hiding inside, so she tries to protect him. The wolf is grateful Little Red Riding Hood has saved his life, and later he has the opportunity to save hers. Far from the big bad wolf of the original story, this is a kind and very much misunderstood wolf. He only wants to be left in peace, and he doesn’t know why he’s being hunted just because he’s a wolf. 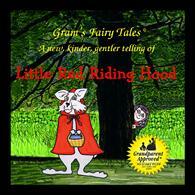 This new Little Red Riding Hood shows kids that all animals deserve respect and consideration. It’s never a good idea to judge anyone based on stereotypes, and sometimes the most unlikely creatures can be good friends.